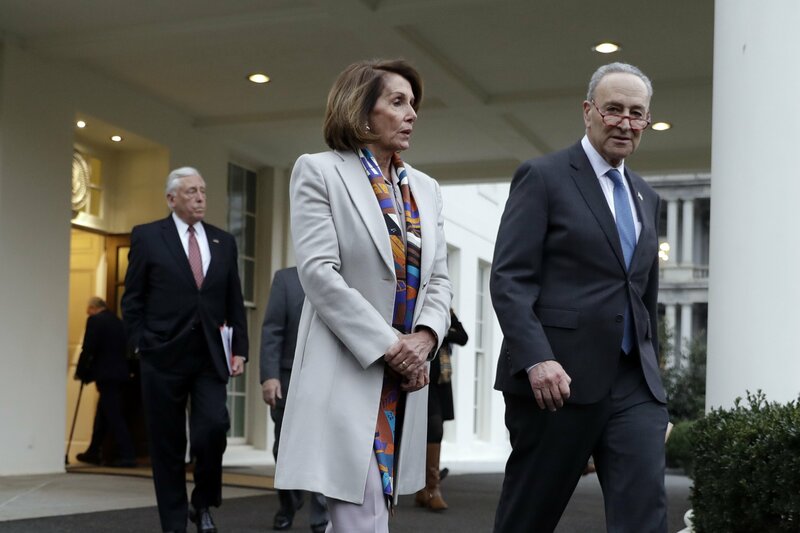 WASHINGTON — No one budged at President Donald Trump’s closed-door meeting with congressional leaders, so the partial government shutdown persisted over his demand for billions of dollars to build a wall along the U.S. border with Mexico. They’ll all try again Friday. In public, Trump renewed his dire warnings of rapists and others at the border. But when pressed in private Wednesday by Democrats asking why he wouldn’t end the shutdown, he responded at one point, “I would look foolish if I did that.” A White House official, one of two people who described that exchange only on condition of anonymity, said the president had been trying to explain that it would be foolish not to pay for border security. In one big shift, the new Congress will convene Thursday with Democrats taking majority control of the House, and Democratic leader Nancy Pelosi said they’d quickly pass legislation to re-open the government — without funds for the border wall. But the White House has rejected the Democratic package, and Republicans who control the Senate are hesitant to take it up without Trump on board. Senate Majority Leader Mitch McConnell called it a “total nonstarter.” Trump said ahead of his White House session with the congressional leaders that the partial shutdown will last “as long as it takes” to get the funding he wants. “Could be a long time or could be quickly,” Trump said during lengthy public comments at a Cabinet meeting, his first public appearance of the new year. Meanwhile, the shutdown dragged through a second week, closing some parks and leaving hundreds of thousands of federal employees without pay. Democrats said they asked Trump directly during Wednesday’s private meeting held in the Situation Room why he wouldn’t consider their package of bills. One measure would open most of the shuttered government departments at funding levels already agreed to by all sides. The other would provide temporary funding for Homeland Security, through Feb. 8, allowing talks to continue over border security. Trump’s response about looking foolish was confirmed by a White House official and another person familiar with the exchange, neither of whom was authorized to describe the exchange by name. Trump had campaigned saying Mexico would pay for the wall, but Mexico has refused. At another point Wednesday, Trump told Pelosi that, as a “good Catholic,” she should support the wall because Vatican City has a wall, according to a congressional aide. Trump has mentioned the Vatican’s centuries-old fortifications before, including at the earlier Cabinet meeting. But Democrats have said they don’t want medieval barriers, and Pelosi has called Trump’s proposed wall along the U.S.-Mexico border immoral. House Republican leader Kevin McCarthy said that there’s no need to prolong the shutdown and that he was disappointed the talks did not produce a resolution. He complained that Democrats interrupted Homeland Security Kirstjen Nielsen as she was trying to describe a dreadful situation at the border. Nielsen, participating in the meeting by teleconference, had data about unaccompanied minors crossing the border and a spike in illegal crossings, and she tried to make the case to the group that current funding levels won’t suffice, according to the White House. “We were hopeful that we could get more of a negotiation,” said McCarthy. He said the leaders plan to return to the White House Friday to continue negotiations. White House spokesman Hogan Gidley said on Fox that Pelosi will be “more able to negotiate” once she is elected speaker, as expected Thursday. The two sides have traded offers, but their talks broke down ahead of the holidays. On Wednesday, Trump also rejected his own administration’s offer to accept $2.5 billion for the wall. That proposal was made when Vice President Mike Pence and other top officials met at the start of the shutdown with Schumer, who left saying they remained far apart. On Wednesday Trump repeatedly pushed for the $5.6 billion he has demanded. Making his case ahead of the private afternoon session, Trump said the current border is “like a sieve” and noted the tear gas “flying” overnight to deter arrivals. “If they knew they couldn’t come through, they wouldn’t even start,” he said at the meeting, joined by Cabinet secretaries and top advisers, including Jared Kushner and Ivanka Trump. With no negotiations over the holidays, Trump complained he had been ”lonely ” at the White House, having skipped his getaway to Mar-a-Lago in Florida. He claimed his only companions were the “machine gunners,” referring to security personnel, and “they don’t wave, they don’t smile.” He also criticized Pelosi for visiting Hawaii. At the Capitol on Wednesday, Pelosi said she hoped Republicans and the White House “are hearing what we have offered” to end the shutdown. The partial government shutdown began on Dec. 22. Funding for the wall has been the sticking point in passing essential spending bills for several government departments. Pelosi said Tuesday that Democrats would take action to “end the Trump Shutdown” by passing the legislation Thursday to reopen government. “Senate Republicans have already supported this legislation, and if they reject it now, they will be fully complicit in chaos and destruction of the President’s third shutdown of his term,” she said in a letter to colleagues on Tuesday. ”″We are giving the Republicans the opportunity to take yes for an answer,” she wrote in a letter to colleagues. The Democratic package to end the shutdown would include one bill to temporarily fund the Department of Homeland Security at current levels — with $1.3 billion for border security, far less than Trump has said he wants for the wall — through Feb. 8 as talks would continue. It would also include a separate measure to fund the departments of Agriculture, Interior, Housing and Urban Development and others closed by the partial shutdown. That measure would provide money through the remainder of the fiscal year, to Sept. 30.